The St Flannan's Conference of the St Vincent de Paul Society meets fortnightly on a Monday evening. 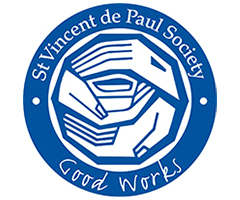 The support we provide is funded in large part by the generous contribution of parishioners to the monthly Vinnies leaving collection. The leaving collection is held on the weekend of the third Sunday each month. To find out more about the work of the St Flannan's Vinnies Conference or how you can be involved contact the Conference on sf4034@svdpqld.org.au or via the Parish Office.